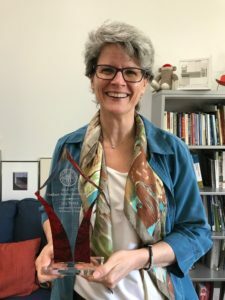 Each year at Florida State, an award is give “to recognize faculty mentors whose dedication to graduate students and commitment to excellence in graduate education and mentoring have made a significant contribution to the quality of life and professional development of graduate students. “ This year, Interior Architecture + Design Faculty member Jill Pable was one of the five university-wide recipients. Dr. Pable headed the graduate program in the IA+D department from 2001-2016 and has mentored many graduate student thesis writers. Her dedication to students is admirable and the department thanks her for her commitment!